Controlling an electric -powered wheelchair remains a challenging task, but a Kent University team in the UK team is on the case. The school has a project aiming to turn the corners in wheelchair independence and quality of life. Two videos posted show the chair in action. Sophisticated obstacle tracking and eye-based guidance are features in their design. The team has been working on a wheelchair that can navigate tight spaces and avoid obstacles encountered while moving out and about in a wheelchair. The Kent University team is focused on helping people with disabilities through assistive systems and augmented robotic wheelchairs. One of the two videos called Wheelchair Head Tracking shows a little NAO robot, trained to pick up and deliver medication to a wheelchair user. 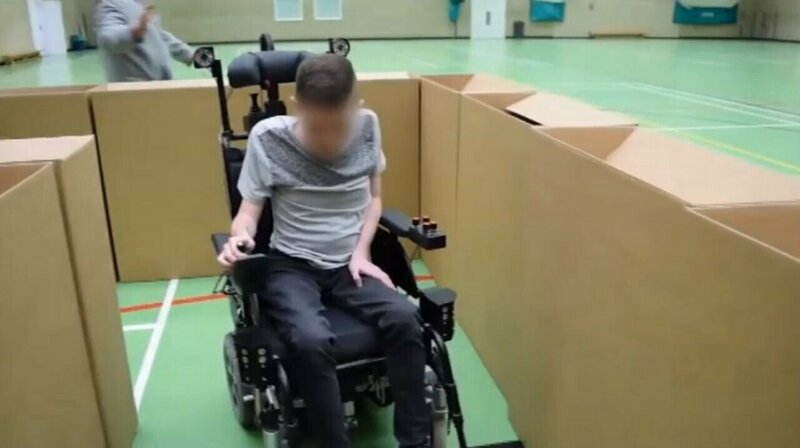 The video shows how the person sends out wheelchair move commands thanks to head movement tracking and eye tracking. The man seated in the video said "Essentially it's tracking my head movement and controlling the wheelchair based on the head movements. Left causes a left wheelchair turn and right causes the right turn..."
Head turns are not the only way the chair can operate correctly. PCMag was told that "We have a combination of technologies, including tracking the movement of a person's head, iris, or nose in order to control the wheelchair." PCMag met with Dr. Konstantinos Sirlantzis, a senior lecturer at the university. His vision is all about wheelchairs of the future which will be enabled by robotic plus-ins and add-ons. Technologies at play in this design. (1) Wi-Fi or Bluetooth communications on the chair (2) an app on a mobile phone, and (3) the kind of parking assist technology used in semi-automated cars, based on ultrasound and vision sensors. Geek.com pointed out that the chair learns as it goes. What it learns is user preferences. "These smart wheelchairs leverage AI to learn users' movement preferences, style of driving, and their current physiology." Joel Hruska in ExtremeTech: "The AI integration is intended to provide a wealth of secondary data for the wheelchair in order to assess the overall state of its user." The chair could gather realtime data and provide notifications if the wheelchair user needed assistance. In the PCMag interview, Sirlantzis touched on the software, written in the lab. It is mainly in C or C++ "plus a little Python." They use the Robot Operating System (ROS), and they create nodes with development partners, such that they share code in the project for interoperability. Moving forward? The project extends beyond the university walls to partnering with other institutions, including National Health Service hospitals. Through a local hospital's neurorehabilitation unit, which caters to people with brain injury and damage from strokes, the team has recruited ten people with disabilities to participate in trials. One important comment about wheelchair design: one-size-fits-all is not a practical rule at all. The user's abilities might change over time; the condition might progress. Hruska noted that Sirlantzis has turned to a modular system whereby components can be integrated into the chairs. The PCMag interview had mentioned some of the chair's modular add-ons including iris detection so the person could move the chair just by blinking. "We have a combination of technologies, including tracking the movement of a person's head, iris, or nose in order to control the wheelchair, again depending on the user's changing abilities over time and condition progression," Sirlantzis said.